Dorothy B. (Preble) Keniston, went to be with the Lord on Oct. 28, 2018 at age 94. Dorothy was raised in Bristol and graduated from Bristol High School with the Class of 1942. She went on to study nursing at St. Vincent’s Hospital in Worcester, MA under the nurses cadet program. On July 7, 1946, she married the love of her life, James M. Keniston, Jr. They enjoyed 66 years together until his passing in 2012. Dorothy worked at InsulFab Plastics in West Franklin as a quality control inspector until age 70. After retirement, James and Dorothy traveled throughout the United States and Canada. They took several road trips to the West Coast to visit family. 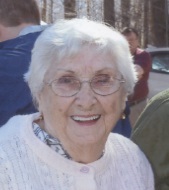 She enjoyed working in her flower gardens, family outings, and especially watching Red Sox games. Dorothy was predeceased by her parents, her husband James, grandson David Huckins, 2 brothers, George and Charles Preble, 2 nephews, Paul Plante and Walter Preble, and a son-in-law, Wilfred Gauthier. She is survived by her four children, James Keniston III, and wife Cheryl of Caldwell, ID, Druscilla Gauthier of Franklin, Nancy Woodward and husband Brent of Franklin, Roger Keniston and wife Diane of Concord, 7 grandchildren, Liane, Lindsey, Lacey, Tina, Ann, Jennifer, and Keith, 21 great grandchildren, and 2 great great grandchildren. Survivors also include a sister, Judy Plante and husband William of Manchester, 2 brothers, Ronnie Preble and wife Mary of Bristol, and Clinton Preble and wife Lidia of Lake Placid, FL, and several nieces and nephews. A visiting hour will be held on Saturday, Nov. 3, for 10-11 am at Thibault-Neun Funeral Home, 143 Franklin St., Franklin followed by a service at 11 am. Burial will follow in Franklin Cemetery.